A human could quickly look at a photograph and immediately identify all the elements in it – a man, a woman, a park bench, a tree, a child on a bicycle, grass, a pathway and a cloudy sky. But who could be bothered teaching a machine these elements that even a child can easily identify? How long would it take to type in all those words and point out each of the elements in just one photo? Then even if you did teach the machine everything about one photograph, would the computer be able to identify the same elements in another photo taken from a different angle? What about words? A computer may have data that labels milk and cola as liquid foods, but it wouldn’t know that milk goes with cereal, but cola doesn’t (usually). The human ability to recognize and recall experiences allows a person to make appropriate decisions. But how can these skills be imparted on a computer? The amount of data entry required would be astronomical. The cost of the required data entry operators would be prohibitive and the staff burnout would be disheartening. That’s where Games With A Purpose (GWAP) comes in. If there’s no money for the staff required to teach the machine, you need volunteers. But volunteers come and go and usually represent a miniscule proportion of society. This was the challenge facing Carnegie Mellon University. How can we get ordinary Internet users from around the world to teach the machine? And how can we be sure they are teaching the machine accurately? Who will quality control that amount of teaching? I will. You will. We will. And we’ll do it because it’s great fun, motivational and promotes thinking skills. Teaching the machine is a by-product as far as the players are concerned. I’ve been playing it for two days now and have amassed over 100,000 points. What for? Who knows, but it’s really enjoyable. Five different games to choose from and you can come back whenever you like to carry on your score. Quality control? You play in real-time with another unidentified, uncontactable person and the machine is watching. In the game Verbosity (my favorite), one person (the narrator) receives an input word and using pre-supplied template sentences must accurately describe that word sufficiently well so that the second player can guess it correctly. Only English words can be used. Multiple players agreeing on terminologies and contexts ensure accuracy. The game is quick at only four minutes and each player takes turns being the narrator. In Tag a Tune, each player listens to music and using words, describes the music they are listening to. Fast, slow, baroque, violins, techno, opera, rock. Based on the descriptions they see from their unseen partner, they each must decide whether they are listening to the same or a different piece of music. All the while, the machine is learning that this MP3 file has these attributes – provided to it and cross-checked by multiple human game players! Of course, you won’t think you’re actually “working for Carnegie Mellon University” because you’re enjoying it so much. And one of the first things you’ll discover is that most of the people you are chosen to play with must be complete idiots! It could never be you who is the idiot. GWAP is tackling a complex problem in a very innovative and effective way. So instead of firing up that next game of Solitaire, why not try a Game With a Purpose? I’ve been playing these games for a few days now as well. You are absolutely right. Some people are totally stupid. Playing Verbosity, the clue was CAKE. So I say “It’s a BIRTHDAY FOOD”. “It has ICING CANDLES”. The person palying with me said “ORANGES”, CHERRIES and PINATA before finally UNDERSTANDING all the clues and typing CAKE. Sheesh. I tried playing the ESP game a little while ago, but it was broken. THe images weren’t appearing. Guess they’ll fix it soon. Really like the music one. It’s very funny when you both agree you’re listening to the same piece of music, but you’re both wrong! Great find PD! But you’re getting me hooked on it. Just been playing Verbosity for 3 hours straight. My husband thinks I’m having an affair! 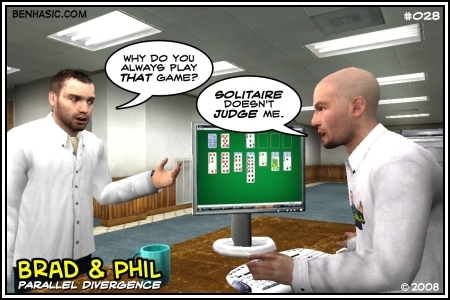 Great Brad & Phil cartoon! Did you you know Solitaire is probably the most played computer game in the world? I used to train people how to use computers and I always used it with new computer users to teach them how to use a mouse. Here’s a recent article I found about it. Thanks for forwarding the blog. We’re glad you like the site, and we’ll be continuing to improve it daily. Thanks for your support and feedback. Yes, great stuff from the GWAP team! They’ve inspired me to make my own game. It’s somewhat like Peekaboom, but generates more precise results. We’ve recently released a collaborative game similar to the von Ahn work that aims to collect judgements on anaphoric coreference. It’s not as glamorously presented or as inherently interesting a task as tagging images or music, however the results could be just as useful for text summarisation and search engines. We’ve done a lot of work to collect robust judgements in the most efficient way possible.